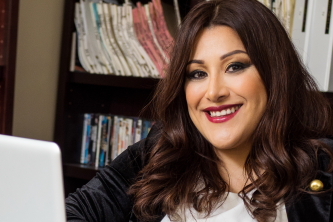 Chicago’s Yelyna De Leon produced, acted in, and wrote the script for a teen slasher that will screen at the 34th Chicago Latino Film Festival (CLFF). 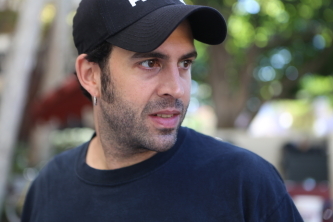 Titled Murder in the Woods, the English-language, U.S.-produced film was directed and produced by Mexican-born filmmaker Luis Iga. 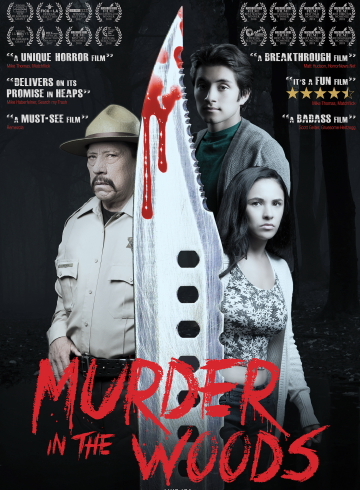 Murder in the woods has a predominantly Latino cast that stars legendary Danny Trejo, Jane the Virgin’s Catherine Toribio, Empire’s Kade Wise, and A Better Life’s Chelsea Rendon and José Julián. According to De Leon and Iga, the combination of the cast, the language, and the classic-slasher structure confused studios and distributors when Iga and De Leon pitched both the original script and finished film. When De Leon was a child, producers of the Chicago TV series Crime Story asked her grandma if they could shoot a scene in their Back of the Yards home. “As a little kid, I was fascinated by the whole experience,” she continues. “So I asked the director if there was anything I could do, and he was like, yeah, actually you can.” The director filmed young Yelyna running to the window to investigate the sound of a gunshot. Yelyna De Leon saw herself on television when it aired. More-than twenty writing, acting, and production gigs later, Yelyna De Leon and Luis Iga’s Murder in the Woods will screen at the 34th Chicago Latino Film Festival. Ever since Iga was a kid in Saltillo, Mexico analyzing the VFX of Star Wars, he dreamed and worked towards attending the same university as George Lucas, the University of Southern California. Decades later, after attaining a BFA at the University of Connecticut and a green card, Iga met De Leon at USC’s MFA in Film and Television program. There, they collaborated on a short film about a domestic violence survivor called Magdalena. A feature-length film was the goal, but they were never able to raise enough money. For the time being, they moved on and De Leon began writing a slasher-horror script. During pre-production, Iga and De Leon discussed the film with Trejo’s agent and assistant on numerous occasions, but they were never given a yes. Four days before filming, De Leon grabbed lunch near the shooting location. By chance, when she left the restaurant, she saw Trejo eating with his daughter in a California Pizza Kitchen across the street. She had never met with him personally. De Leon entered the California Pizza Kitchen, ordered soup and a cookie on a full stomach, waited till Trejo finished eating, and then delivered her elevator pitch while the kitchen staff surrounded Trejo for photos. He agreed to be in her film. While assembling the cast was tricky, Iga and De Leon both agree that the most difficult part of making an indie film with a nearly all-Latino cast is raising the money. As for the actual filming, Iga emphasizes that having the ability to “wear multiple hats” and to simply “find a way to do it” was the key to directing and producing his first feature-length film. Murder in the Woods was shot in 15 days, and Iga says he averaged two to three hours of sleep a night. Iga produced and directed the film, designed all of the marketing posters, and worked as the VFX supervisor. When the first Director of Photography quit, Iga and the gaffer had to pitch in on shooting. De Leon and Iga both laugh and jokingly suggest to “never hire a couple.” The original Director of Photography and the make-up artist, his girlfriend, both quit in the middle of production and forced Iga and De Leon to improvise significantly. Despite the numerous hurdles for what Iga and De Leon call a “micro budget” feature, they pulled off a well-crafted slasher flic with a star cast. Murder in the Woods will be screened at the AMC River East on April 7 at 9:15 pm and April 9 at 8:45 pm. For more information on the 34th Chicago Latino Film Festival, click here.